“Batman v Superman: Dawn of Justice” will skyrocket to north of $150 million in its much-anticipated opening in the U.S. and Canada this weekend, industry analysts projected on Tuesday. Warner Bros., which developed and is distributing the DC Comics superhero epic starring Ben Affleck as the Caped Crusader and Henry Cavill as the Man of Steel is more conservative and sees a domestic debut of between $100 million and $140 million. It will open in 4,200 theaters in the U.S. and Canada. Domestic numbers in that range will mean the global haul for the weekend could go as high as $350 million, since the studio is projecting roughly $200 million for the film’s concurrent rollout in 65 foreign markets. “Batman v Superman” has a good shot at shattering the box office record for a March opening held by “The Hunger Games,” which debuted to $152 million in 2012. The best domestic opening ever is the $247.9 million domestic launch of “Star Wars: The Force Awakens” three months ago. Previews begin at 6 p.m. Thursday at the majority of the theaters where it will be playing. The returns from those shows will swell the Friday grosses into which they’re added, and the entire weekend should get a major boost from 3D screenings at roughly 3,500 locations and showings at nearly 400 IMAX locations, both of which bring markups. Zack Snyder directed “Batman v Superman” from a script he wrote with David Goyer and Chris Terrio. He also helmed “Man of Steel,” which opened to $116 million in 2014. The last Batman movie, “The Dark Knight Rises,” opened to $168 million in a 2012 debut marred by the Aurora, Colorado theater massacre. 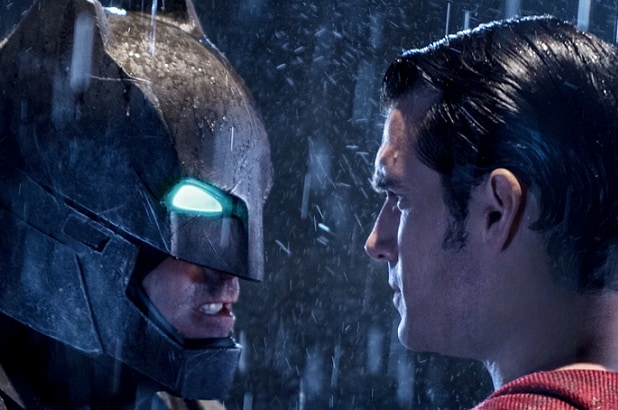 With a $250 million production budget, “Batman v Superman” represents a major financial wager by Warner Bros. But the stakes are in fact much higher, because this is the first of 10 DC Comics-based movies that Warner Bros. has scheduled through 2020 — an answer to Disney’s Marvel Cinematic Universe slate — and will establish the momentum for the films that follow. The next DC Comics film on that slate is the David Ayer-directed “Suicide Squad,” set for Aug. 5. After that, “Wonder Woman” is scheduled for June of 2017. Gal Gadot will star as the warrior princess in that one and she factors prominently in “Batman v Superman,” which also co-stars Amy Adams (Lois Lane), Laurence Fishburne (Perry White), Jeremy Irons (Bruce Wayne’s butler Alfred) and Jesse Eisenberg (Lex Luther), along with Diane Lane and Holly Hunter. The vital signs for “Batman v Superman” are very strong, suggesting Warner Bros. marketers have timed their campaign well. Its Twitter profile is larger than that of “Avengers: Age of Ultron” at a similar stage and it’s outpacing the Marvel sequel by a 3-1 margin on Facebook. It was dominating advance sales at MovieTickets.com and Fandango, where it is the best-selling superhero movie ever. The biggest concern is the reviews. They started rolling in Tuesday afternoon and only 40 percent of those on Rotten Tomatoes were positive. Ecstatic reaction from special premieres in New York and Mexico City and several fan screenings has further stoked anticipation, but Tuesday’s Brussels terror attacks could keep some Europeans home. Tuesday’s london premiere was canceled and the studio is monitoring the developments closely. There is one other movie opening wide on Friday. Nia Vardalos‘ long-gestating sequel to her 2002 indie hit “My Big, Fat Greek Wedding” will debut in 3,130 theaters for Universal. The tea leaf reading will end with Thursday night’s previews, but there was one more Tuesday: The studio’s ‘Batman v Superman” web site crashed, very likely another positive sign.